William Moore was first recorded in business as a gunmaker in 1808 and his business continued until bought by Cogswell & Harrison in 1908. He trained with the famous Joseph Manton and in turn, trained both Henry Atkin and Frederick Beesley amongst many other stalwarts of the London guntrade. 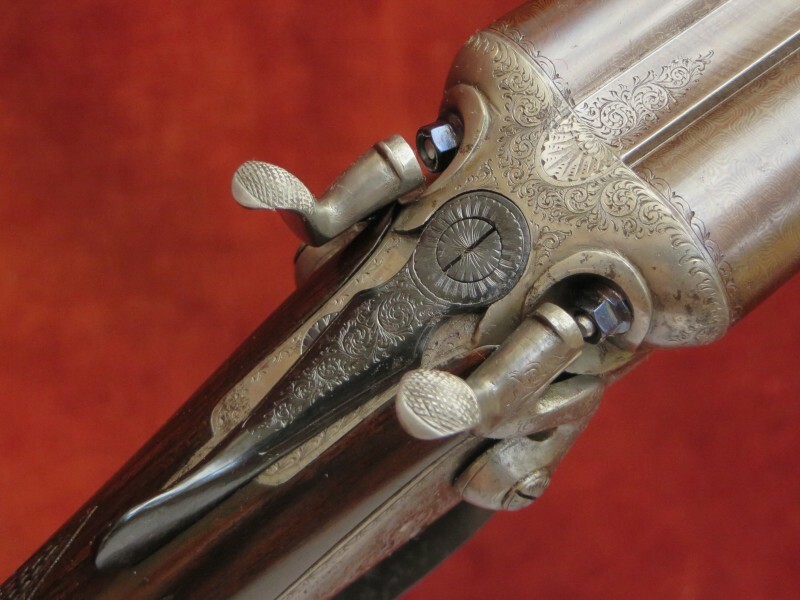 The dating of this gun is a bit difficult as the address on the barrels was only occupied from 1896 yet its style suggests it is rather older than that. 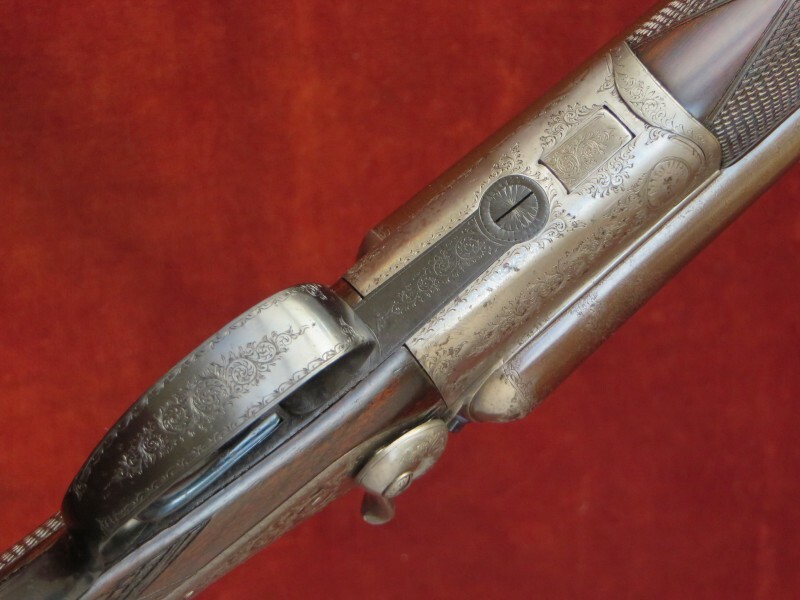 This conflict is explained by the number 30736 on the forend loop which is a Scott number from 1882 or alternatively a Greener number from 1884, these two manufacturers being the main suppliers to the trade at this time and the only ones with such a high production number. 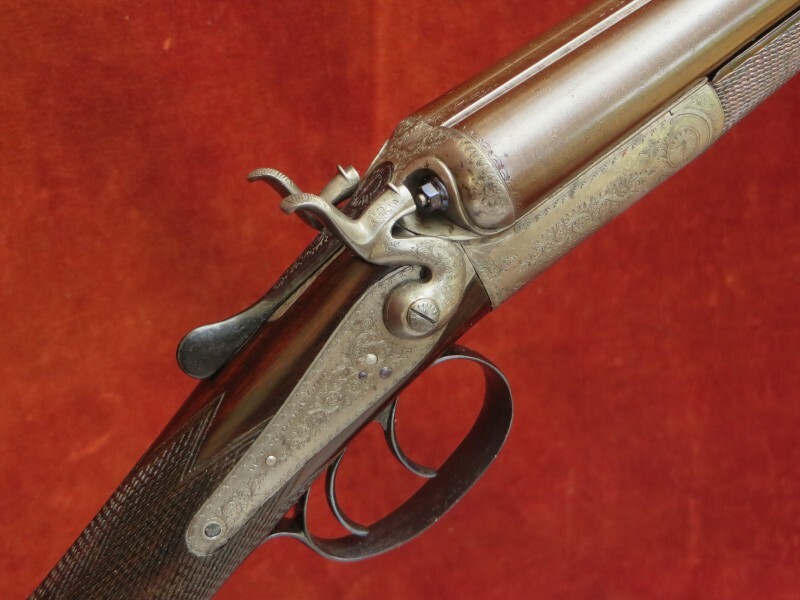 This suggests that this gun languished in storage for some years until being finished and sold after 1896. 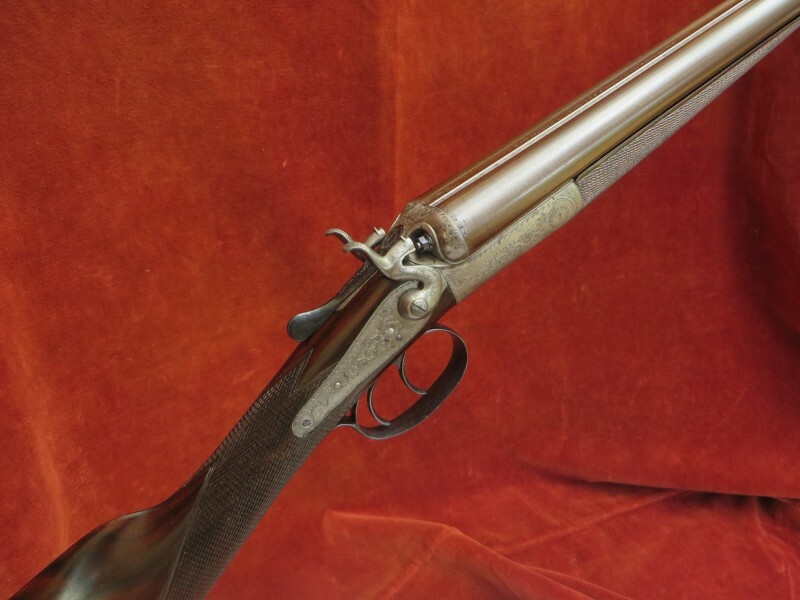 This gun is a fine example of the elegant, small bore, sporting hammerguns that were commonly purchased for young people or by ladies in the last quarter of the 19th Century. These guns have often had a very hard life and it is rare that the original Damascus barrels have survived over 130 years of use and abuse. The fact that these have done so and retain very acceptable minimum wall thicknesses is a miracle. 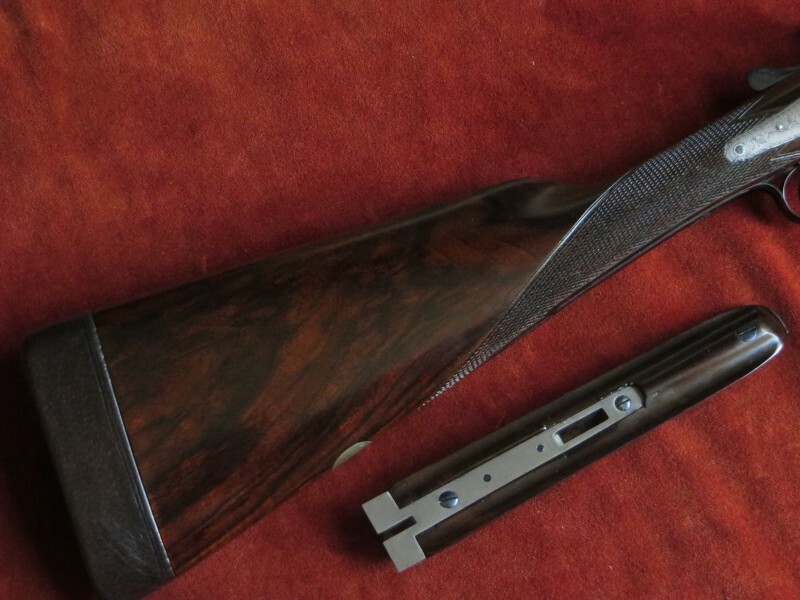 In the fairly recent past, the stock and forend wood has been replaced and this, coupled with the sensitive restoration, makes it a very pretty gun for either game or clays. Hacket style snap-on forend catch. The rebrowned damascus barrels are 28" in length, chambered for 2 ¾" (70mm) cartridges and are of brazed 'dovetail' lump construction with soft soldered ribs. Top rib is of smooth, concave game type. There is some external pitting of the barrels, left in order to preserve wall thicknesses. London reproof for 70mm nitro powder cartridges in 2007. The replacement Straight-hand Grip Stock and Splinter Forend are crafted from highly figured walnut. 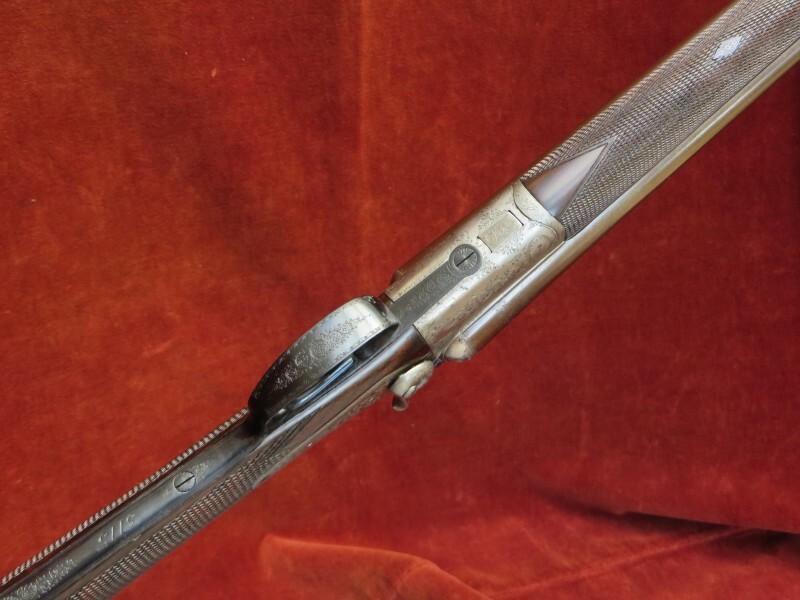 The forend carries an engraved steel tip and has a small inlet repair to its edge near the knuckle. 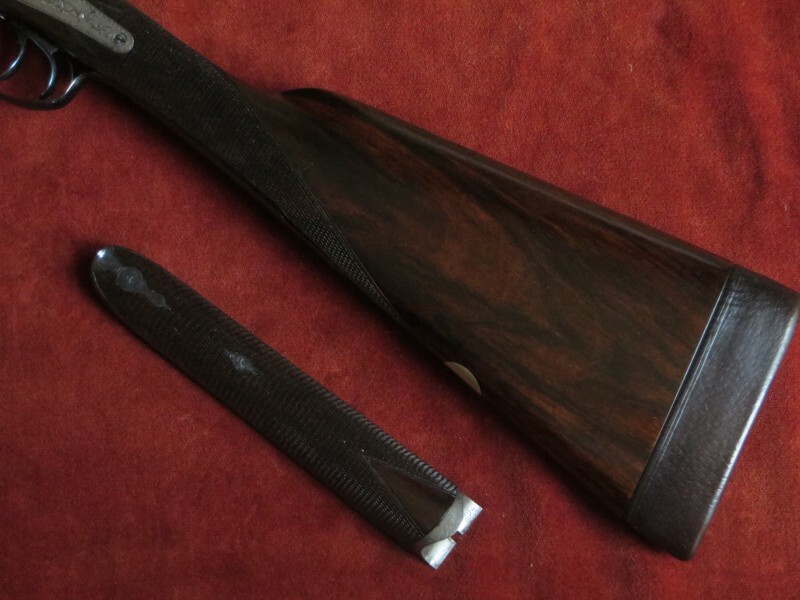 The stock is lightly cast-off for a right handed shot, is finished with a 1 ¼" leather covered recoil pad and features a vacant white metal oval. The 18 lines per inch chequering has been refreshed to a normal back-action design. 'Purdey Bolt' patent no. 1104 of 1863.